Arthur, Paul, “History and Crass Consciousness: George Kuchar’s Fantasies of Un-power,” pp.151-58. 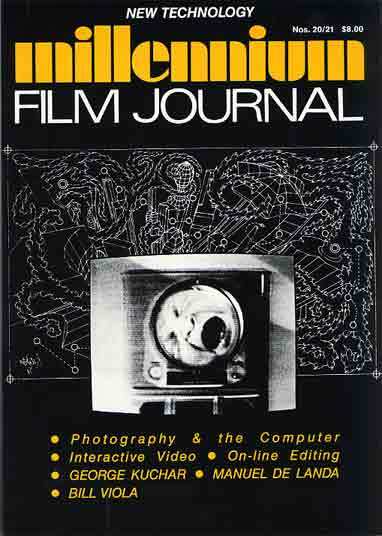 Binkley, Timothy, “Camera Fantasia: Computed Visions of Virtual Realities,” pp. 6-43. De Landa, Manuel, “Real Time,” pp. 66-76. De Landa, Manuel, “Urban Growths, Drawings and Software,” pp. 58-65. James, David, “inTerVention: The Contexts of Negation for Video and Video Criticism,” pp. 46-54. Tafler, David, “Beyond Narrative: Notes Toward a Theory of Interactive Cinema,” pp. 116-31. Taubin, Amy and Grahame Weinbren, “STANDBY: An Interview with Rick Feist, On-Line Video Editor,” pp. 135-48. Youngblood, Gene, “Metaphysical Structuralism: The Videotapes of Bill Viola,”pp. 80-114.